The October Vest? Does it sound too much like Oktoberfest? and in December? That's when I was supposed to have it done so I thought it appropriate but I don't know... I could see myself wearing this in Germany, I'm not much for drunk crowds so I don't think I'd hit Munich for Oktoberfest but I've heard Berlin is an amazing city right now and would love to go. Back to the real reason you're here... this vest was inspired by my daughter when I saw her put on one of her vests upside down. 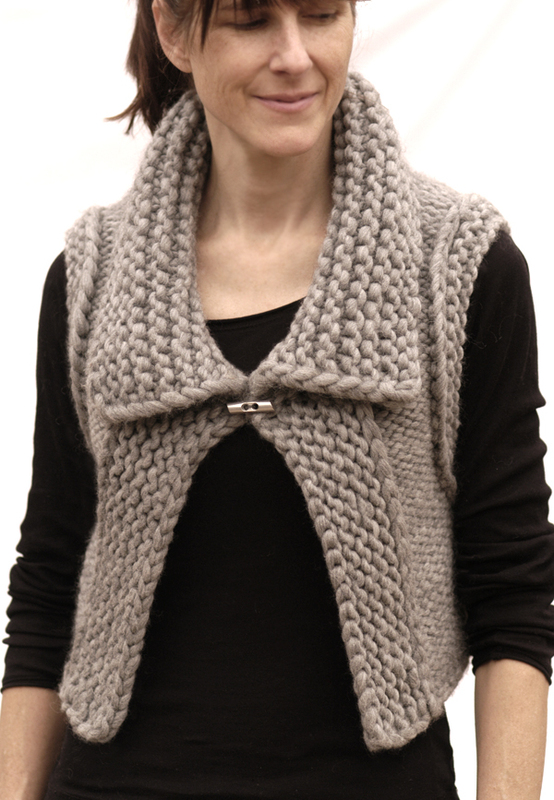 The bottom of the vest created this wonderfully large wide collar that I wanted to recreate. I didn't intend to have it reverse stockinette stitch but after completing it I liked it better inside out, so the right side became the wrong side and has a lot more visual interest for me. This could be a reversible piece if you wove your ends in perfectly, mine is not. Yarn used: Cascade's Magnum. 2 skeins for the S/M & 3 for the Large. This pattern is written with one set of numbers, the difference for the sizes is the gauge. S/M = 30-34” bust; L 35- 40” bust. I used a #17 to obtain both gauges for the different sizes but a #15 or a #19 might be used too. Techniques used: invisible (provisional) cast on, short row shaping and picking up stitches. I would rate this for at least the advanced beginner. This would be a good project to learn short rows with since there are only a couple of turns. looks amazing!! 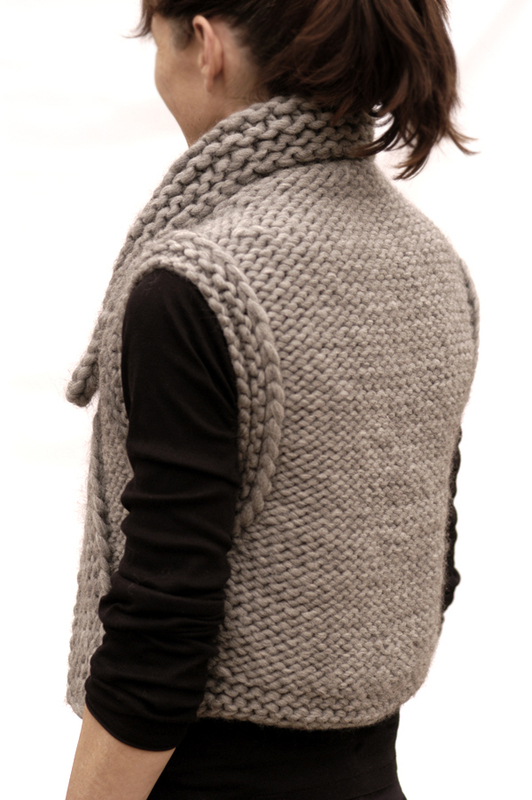 Love the chunky vest, it looks so cozy. It is! I have to say it feels very cozy under my coat on a chilly day. I love this and can't wait, wait to start it. It's really cold here today. Not LA cold, Chicago cold!!! Yes, it's colder than it should be here, so soon! 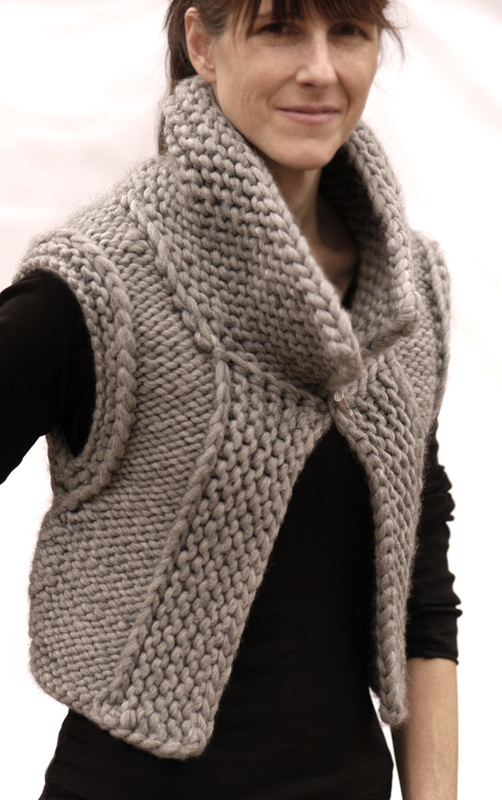 I really love this - especially the reverse stockinette. Ooh, I really like this. I am going to have to keep it in mind for when I'm done stashbusting and can buy some nice bulky yarn. And for when I'm not pregnant anymore and can wear things like this again. Great design! I like this one is there away to make it longer? is it as easy as the vest? Sure you can make it longer! 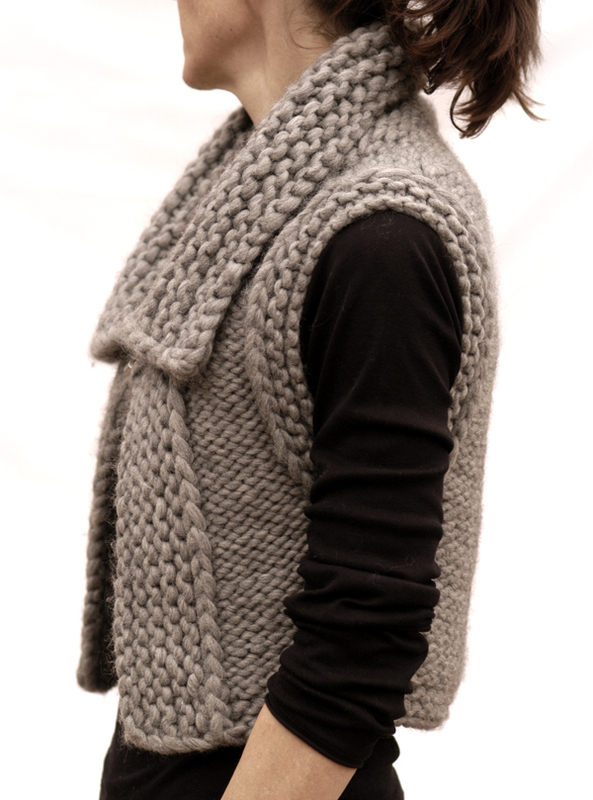 Since the vest is worked top down if you want it longer keep on knitting. 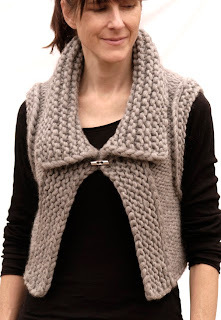 It's not quite as easy as the Reversible Vest in that there's a little shaping involved. I just stumbled upon your blog and had to tell you - I LOVE YOUR DESIGNS! I am a beginner but feel very motivated to try one of your patterns soon. Thanks for sharing! !